DEERFIELD BEACH, FL — January 2019 — Inovaxe is pleased to announce plans to exhibit at the 2019 IPC APEX EXPO, scheduled to take place Jan 29-31, 2019 at the San Diego Convention Center in California. The Inovaxe team will showcase the new SMART InoMechanical storage solution, as well as its new SMART SREX stationary storage solution in Booth #3417. The SMART InoMechanical storage solution is designed to store and manage all your inventory needs. 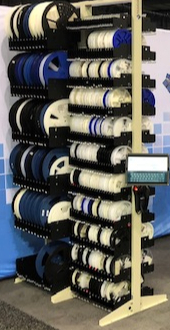 As with the Inovaxe reel storage system, the InoMechanical carts and racks utilize the powerful InoAuto material management system. This system allows user to store and manage bagged parts, JEDEC trays, PCB’s and more. This exciting new product comes in two models and a multitude of configurations. The first model showcased is the SR140. The SR140 is a mobile smart cart that not only can support reels, but can now support trays, bins, and other non-reel parts as well. 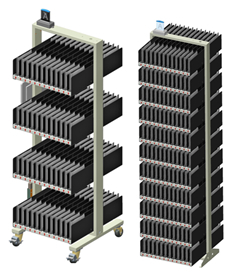 This mobile smart cart can accommodate up to 7 rows of reel parts or 14 rows of non-reel parts or a combination of both. The new SREX200 is a fixed smart storage system that allows all manufactures looking for storage and traceability of non-reel parts. Within the small and compact footprint you can store and manage up to 264 unique part numbers. This can include bagged parts, JEDEC tray parts, PCB's, and more. These two new additions to the Inovaxe family of smart storage solutions will allow users to manage every part in their inventory, not just their reel parts.